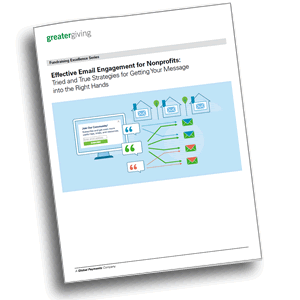 This guide covers everything you need to effectively engage your donors, potential donors, volunteers and sponsors. From list building to engaging content and industry tools, sharing your mission has never been easier. Reaching out to your audience and growing your email list. Frequency and length of email communications. Messaging, subject lines, and email content. Creating and implementing a top-level strategy to maximize effectiveness—and by extension, making your time go farther. Using for-profit business tools to manage and maintain your organization’s email reputation. By submitting this form, you agree to receive emails from Greater Giving and can unsubscribe at any time.